This article first appeared in The Edge Financial Daily, on July 24, 2017. KUALA LUMPUR: With billions of ringgit in mega infrastructure projects that have been and are to be awarded, the construction sector has been hailed as a bright spot in corporate Malaysia. However, between rising raw material costs and labour shortages, contractors that have been too aggressive in bidding for jobs may be running into trouble. Sources familiar with the Damansara-Shah Alam Elevated Expressway (DASH) told The Edge Financial Daily that at least one contractor has pulled out from the project. “The contractor for the Damansara Perdana to Penchala Link portion of the DASH has pulled out. This is not surprising to us. The prices that some of these contractors were bidding were simply too low. Today, steel prices have jumped nearly 30%. If you did not go in with reasonable margins, you’re in trouble,” explained one industry veteran. “As an experienced highway developer, we have a solid mitigation plan. To prevent a major disruption, all options will be explored, including a retender if necessary, added Prolintas. According to sources, the package in question was awarded to System Engineering Construction Sdn Bhd for RM340 million. It remains to be seen if this will remain an isolated incident, or if it is an early indication of deeper problems that the industry might be facing. 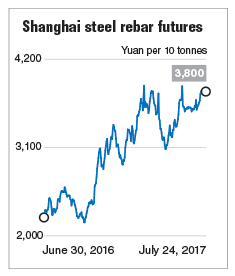 It is worth noting that Shanghai steel rebar futures have gained almost 28% this year alone, and are up over 60% year-on-year, closing at 3,776 yuan (RM2,391) per 10 tonnes contract last week. Meanwhile, System Engineering is only one of the many relatively small construction companies that are involved in such projects. The Edge Malaysia weekly last year reported that civil works for the DASH and the Sungai Besi-Ulu Klang Elevated Expressway (SUKE) were almost exclusively awarded to unlisted construction companies. Both projects are owned by Prolintas, the wholly-owned highway concession arm of Permodalan National Bhd. Last year, a total of 17 contracts worth RM8 billion were awarded to 22 companies, of which only three were subsidiaries of listed companies. To be fair, most of these companies appear to have some background in construction and infrastructure. That said, the concern arises from the financial capacity of these companies to take on such large projects. “We (big construction companies) were looking at the prices these guys were bidding and we were scratching our heads. Some were bidding as much as 30% lower than us! If they think they can do it at those sort of prices, we are more than happy to let them do it. For us, we rather focus on projects that can make money,” said an executive from a major listed construction company. While Prolintas did not wish to comment on contractors pulling out, it pointed out that it has “a stringent tender process and the companies that are awarded contracts by Prolintas for SUKE and DASH are chosen based on merit and after a rigorous due diligence process which includes financial capability and performance”. For the financial year ended Oct 31, 2015, the latest available financial statements of System Engineering showed the company only had a share capital of RM5 million. It had a total asset value of RM27.4 million against RM21 million in debts. In contrast, the company was looking to take on a RM340 million project. In fact, there is some indication in the market that this might not be an isolated incident. Channel checks with reputable construction companies revealed that queries have gone out from companies awarded packages in the DASH and SUKE seeking partners that will be able to help finance and construct the highway. “Without naming names, there are some parties out there that are looking for financing help to do these highway projects. They simply do not have the capacity to do such large projects. There are these so-called agents running around approaching other contractors, looking for help,” said one industry executive. But he pointed out that the razor-thin margins, the volatile costs of construction materials, as well as the labour shortage make such projects untenable. “When your margin is low, you will try to squeeze your suppliers. In the case of these elevated highways, they will try and get better prices from the precast [concrete] boys. “But the precast boys have enough work to do, MRT (mass rapid transit) 2, LRT (light rail transit) 3 are keeping them busy. No need to take the risk and prop up these low-margin projects,” said a construction consultant. Against this backdrop, Prolintas stressed that its highway projects are now 2% ahead of schedule and are 13% complete.